The growth of plug-in electric vehicles and the infrastructure to power them is playing out nationwide and in West Virginia. EV fueling station at Pipestem State Park. The number of electric vehicle charging stations in West Virginia is growing too. As of April 5, there are 60 public stations with 187 outlets in the state. Of those, six are what’s known as direct-current fast chargers and are installed in Morgantown, Triadelphia, Beckley, Martinsburg, Charleston and Weston. These six stations total 44 charging outlets. 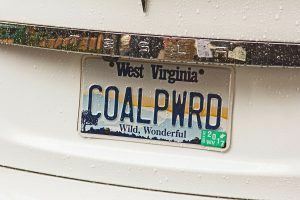 “West Virginians should care about electric vehicles because electric cars use made-in-West Virginia power from the electric grid,” Weirick added. And even without utility-scale solar in West Virginia, there are more than a few electric vehicle owners using rooftop solar to help power their cars. 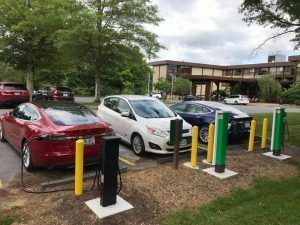 Electric vehicle charging infrastructure is getting a boost under several new programs, through Volkswagen and Tesla and at the local level as more West Virginia cities are installing electric vehicle supply equipment (EVSE) on their own. After researchers at West Virginia University’s Center for Alternative Fuels, Engines and Emissions (WVU CAFEE) uncovered Volkswagen’s intentional efforts to deceive emissions tests on diesel-powered vehicles, the company’s stock tumbled, its CEO resigned and Volkswagen owners were left in the lurch. To read about WVU CAFEE’s work in this regard, click here. The recent Volkswagn settlement provides West Virginia with $12.1 million for transportation projects that can reduce NOx, the pollutant the company deceived regulators about. States may use up to 15 percent of their funds for zero emissions vehicle infrastructure. “Look for the W.Va. Department of Transportation’s plan, to be released for public comment later this year, by checking this page frequently for updates: http://go.wv.gov/volkswagen,” said Perry McCutcheon, W.Va. Division of Highways, Planning Division. As part of the National Zero Emission Vehicle (ZEV) Investment Plan, Volkswagen created a subsidiary—Electrify America—aimed at expanding electric vehicle infrastructure across the nation. Electrify America will invest $2 billion over the next 10 years in Zero Emission Vehicle (ZEV) infrastructure, education and outreach. The goal is to create a nationwide network of workplace, community and highway electric vehicle charging stations that are convenient and reliable. Many West Virginia cities and towns have submitted proposals to Electrify America. Learn more about Electrify America by clicking here. Tesla offers free chargers and installation cash as part of its workplace charging program. While installation costs are not fully covered, the percentage rises with the number of stations to be installed. Tesla seeks locations with a minimum of 100 employees that want at least 10 stations. Learn more about Tesla’s workplace charging program here. Communities interested in exploring options can assess their readiness for the arrival of electric vehicles by using the Plug-In Electric Vehicle Readiness Scorecard assessment. As local and regional leaders know, PEV readiness is a community-wide effort, requiring charging infrastructure, planning, regulations, and support services. This scorecard supports these efforts by helping leaders in cities, counties, and larger regions evaluate their readiness, receive feedback about strengths and improvements, and track progress toward readiness. You may also contact the W.Va. Clean State Program through Kelly Bragg (kelly.a.bragg@wv.gov; 304-957-2004) or Tiffany Bailey (tiffany.j.bailey@wv.gov; 304-957-2050) for more information. If you want to check the number of alternative fueling stations nationwide and in West Virginia, please use the U.S. Department of Energy’s Alternative Fuels Station Locator by clicking here.